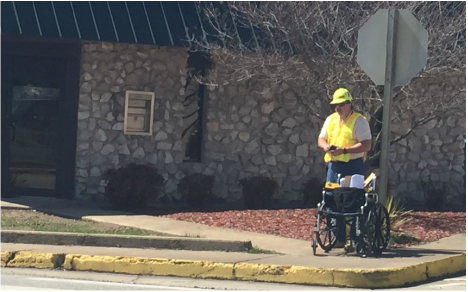 A worker with MoDOT pushed a wheelchair up and down the sidewalks along Main Street to help finalize the plans for the new sidewalks slated for April 2016. Main Street in Cassville will get a major improvement thanks to a project initiated by the Missouri Department of Transportation (MoDOT). The sidewalks on Main Street from 5th Street to 17th Street will be improved to be Americans with Disabilities Act (ADA) compliant. However, employees with MoDOT were out working on the project by pushing a wheelchair up and down the sidewalks and taking notes and measurements on Monday and Tuesday this week. By the end of the project, a multitude of guidelines will be met that will make the sidewalks safe and easily accessible for persons with disabilities. Everything from the surface of the sidewalk to the curbs, ramps and drainage systems have to meet certain criteria. Walensky said, “[MoDOT] said they have had this on the books for a long time with the Southwest District in Springfield.” That district will be the ones completing the overhaul.